I joined the masses today, friends. 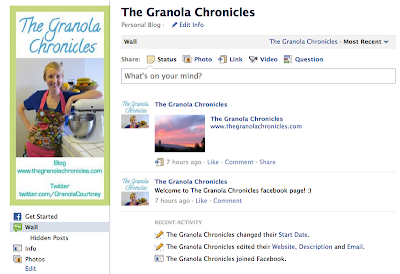 You can now LIKE The Granola Chronicles on Facebook! I did this for various reasons, one of which was because I kept bombarding my friends' news feeds on Facebook with recipes, blog updates, etc. I decided that if people were actually interested, then they'd LIKE the page. Easy enough! I also created a page as a way to interact with more of you. I cannot explain how much I truly enjoy blogging and the friends I've made through this online community. Your support over these past five months has been absolutely unbelievable - I'm humbled that you keep coming back for more.